Puzzle: Beautiful puzzle, lots of small detail adding to the challenge, but larger areas of gradient colours and the manageable size of 750 pieces make the assembly easier. Great places to start are the sky, the dark of the water, and the green hill bordering the sky. Bottom right region of uniform beige, the colourful stripes of the boats, and the ridged area near the water, in the bottom right quarter, as well as the close-up of a green plant at the bottom right, can be tackled next. Larger buildings such as the orange/red one in the middle of the picture, yellow one next to it, and the white one ending the row of boats can be done next. From that point, it’s a bit more challenging, but vertical guides of completed buildings can help place the rest. Lovely imagery and fun to assemble. 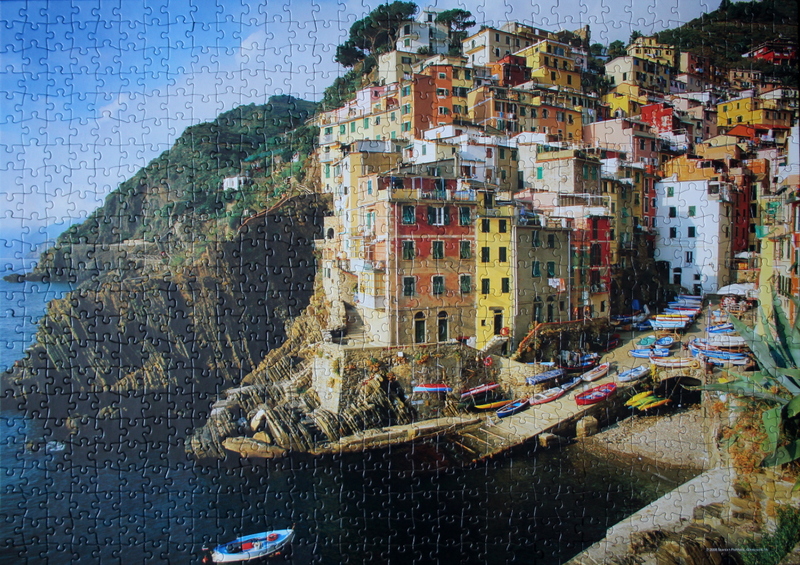 architecture, boats, Italy, landscape, mountains, puzzle, Riomaggiore, sea. Bookmark.